Beachfront bungalow; Beach front Muro Alto; Porto de Galinhas; Private pool. 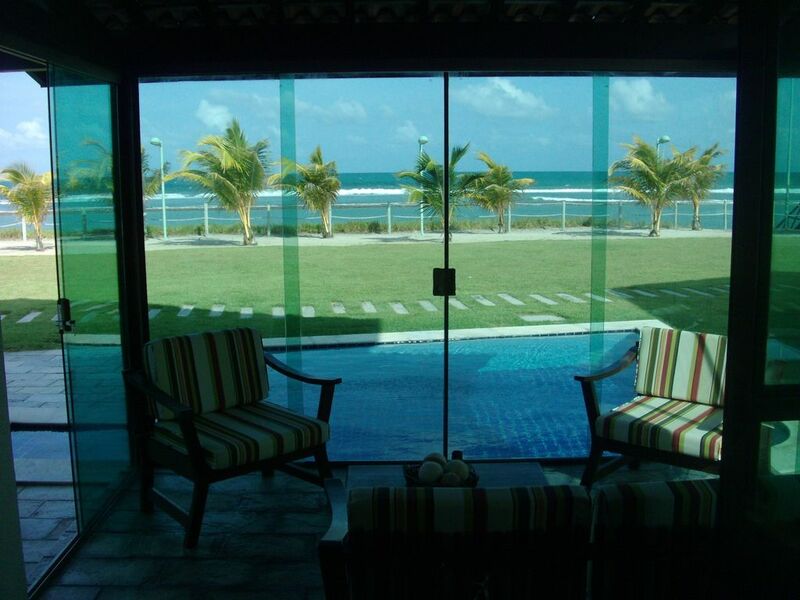 House 3 qtos (two suites + 1 social bh) Closest Porto de Galinhas. Up to 10 people. Two-story house, totaling about 110 square meters of building area. Upstairs: two suites. On the ground floor: living room, bedroom, bathroom, front porch with luxury shower and covered service area. All rooms with air conditioning and TV's LCD 32 "with satellite reception. The two suites have 1 double and 1 single in each. The ground floor room has 1 double and 2 singles. Total of 10 beds. Large closets. Hot water in all showers via external heater core. Room with LCD TV 42 'with satellite reception and DVD; table with 4 chairs and chair 3 seats, forming integrated environment to the balcony that has 1 love seat and 2 armchairs, with the possibility of arming network. Private pool in front of the balcony. Kitchen with fridge-freezer, microwave, stove 6 burners, sandwich maker, blender, cabinets and other utensils. All showers have hot water from the heater in the service area. All boxes with luxury shower. All equipped with lockers. The condo features umbrellas, tables, chairs and sun loungers on the beach, swimming pools for children and adults (with this swimming lane), chuveirões, toys for children, parking with two spaces for each unit and parking for guests. On the beach is no option to rent kayaks, stand up paddle, banana, etc. and hiring raft rides, buggy along the beaches and cars to tourist places. There are also day laborers services (optional). In Porto de Galinhas there are natural pools as a must see attraction and the varied and award-winning restaurants of the place. There also know the beautiful Hippocampus Project (preservation of Seahorses). There attractive buggy rides for all the beaches in the area to know: Camboa, Muro Alto, Cupe, Pontal Cupe, Porto de Galinhas and Maracaípe (the latter inserted in the Brazilian circuit Surf). Be sure to visit the stunning beach of Sheep in tour that takes you home. Stunning beach, named after the wall of higher sand that borders the beach. The calm waters that flow between the sand and the long line of corals form beautiful natural pools and warm throughout the length of the beach. The wide range of corals allows formation of pools where several species of fish can be admired. On site are deal raft rides, banana boating, kayaking and buggy, which extend the leisure promoting optimum levels of wellness and better observation and advantage of the local coastal nature resources with their embroidered coral eternal white foams at the sound of modulated waves the constant cool breeze. Privileged view of the beautiful burning New Year's fireworks promoted by local resorts, especially the Nannai Beach Resort.